My Dogs Love Me: Thanks for the Pawsome Blogger Award, Nola! Thanks for the Pawsome Blogger Award, Nola! Hey friends. I would like to thank Nola for this newest award I got from her. I don't know what it means yet (except I'm so PAWSOME!!!) or how the mechanics of this award goes so I'll just follow her way. 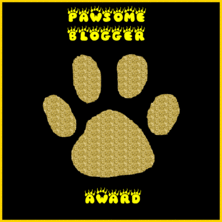 In order to accept the award, I have to pass it along 8 wonderful bloggers who are so PAWSOME as well. 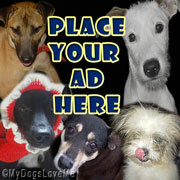 Here are the blogs that bring me fun, love, laughs and furiendship. Thank you, once again, Nola!!! Okay, eating time... see you after my nom noms. You really are pawsome!! Not surprised you got this award buddy!! Thanks for thinking of me and awarding it to me - very sweet!! Haopee, Gosh you make me blush. Me a "Pawsom Blogger" wow. It doesn't surprise me in the least that you were awarded this cause we love your blog, and we think it is Awsome. Hey Congratulations!! Enjoy your nom noms!! wow,another award! you must think we are really pawsome, to give us a second award! thank you so much! Thanks very much for this, Haopee. I'll have to do some thinking about who to share it with. Thank-you for my award. :) I'll have to think who to share it with. @Snoops: You deserve it as well, Snoops. You are part of my daily bearded collie regimen. According to studies and researches done by... me, doing a daily check on your blog helps make me feel young. @Bert: Haha. Awww. Well, I love your blog, too, especially your obsession with Charlotte. And besides, even though you tread through the waters and play with your friends, your fur always look smooth and clean... ^_^ LOL. @BM: I would've chosen you too, BM. But you're already in Nola's award. I might jinx it if I added you here too. ^_^. Congratulations on your award too!!! @K9: Thanks. I can't wait for your other posts. Mr. Turkle cracked me up. Never in my life have I read about a Turkle- I mean Turtle Blogger. @Y&R: Of course, you're a great pet blogger. Now, if only you could share with us what life is while you lived in different continents. Anyway, I visit your site for my daily dose of schnauzer narcotics, so I guess that should say it all. @When I Grow Up: You seriously have to give me a nickname to call you. I can't just make a short cut out of your profile name. Well, in due time, you'll definitely get an award yourself. I love your drawings! @Tegan: Good luck on that, Tegan. I can't wait to read your post on this award. I know you have some great and knowledgeable friends to share it with. I'll be rooting for you. If this comment is a duplicate, I'm very sorry. I made a comment thanking you for the Pawsome Blogger Award, but I don't see it. I'm really excited about this Award since I've never ever gotten it before! Congratulations to you, and thanks for thinking of me! woo woo woo!!!! @Hawky: Weird! I'm pretty sure I published them. And that was the time I visited you and told you about it. I wonder where it went?!? But thanks for posting again. @Rumpy: Of course! You have a good blog and I love reading your features. I hope Dede gets better.